Nothing like a spring cleaning where all kinds of memories are rescued from the most secluded reaches of the closet, dusted and viewed anew . 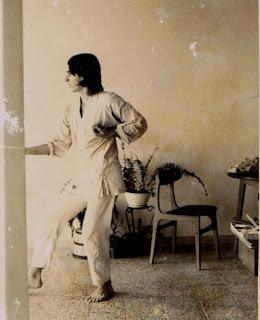 This old photo of me dates back to 1973,taken as I was practicing karate with a friend in an old university-years apartment. A perfect place to practice since I had no furniture save a small round dining table , 2 director chairs, and throw cushions. That practice Gi cost me $15, the cheapest in the store. I was a white belt. This was long before cell phones, Internet, and for that matter, even satellite broadcasts. Practicing a style of karate without knowing there were many other styles of karate, and many other styles of martial arts. All I knew I got from the dojo and it wasn’t much, just the first two katas of the syllabus (fukyu, gekisai ichi). It was all monkey see, monkey do. No Japanese or Okinawan terminology beyond the salutations. Just a mimeographed sheet with a short paragraph on the history of the style and a few others on dojo etiquette. I knew less than nothing and that little nothing I practiced every day and at every opportunity. A white belt now knows more than I knew at brown belt, can see katas and forms of every style and all the martial arts, the legendary teachers at the click of the mouse, order martial arts books online, chat and comment on all the minutiae that his/her heart desires. I would practice in that living room the little I knew. I had the space, I had the time, and I had my foolish youth to spend as I saw fit. I’ve come full circle. I think I know a bit more. At least it is all a click away. Even got a blog, something truly inconceivable, unimaginable in that empty space of my youth in 1973. My living room now is more cluttered of all the things one may accumulate in a lifetime, and I must move more carefully between bookcases and furniture. I know a bit more but not that much more. I have just been practicing the little I know longer, years. The invisible guy I was practicing with died nine years ago. My youngest son is much older than I was then. The old guy in the sidebar smiles.